A kick scooter for kids is a great way for children to exercise. Most children love these scooters because they are fun, they are something between a skateboard and a bike (they have a handle bar) and because they are "cool". Kick scooters have become so popular that there are even adult versions available. It is not uncommon to see business people in large cities using these push scooters. There are even motorized scooters available running with an electric motor. A kick scooter for kids helps children exercise and work out their arm and leg muscles as they push their feet on the ground to move forward. And just like with bicycles, they also help them acquire good balance and coordination. Most kick scooters are made of aluminium alloys so that they can be sturdy, very light weight and easy for kids to push and move around. They also have a hand brake so that children can stop easily. Many are foldable and hence very easy to carry around. We recommend that you also get protective gear for your child such as a helmet, knee and elbow pads. By the way, you can check our kids bikes section for helmet ideas! The first scooter that we recommend is the Razor A3 Kick Scooter for ages 5 and above. This kids Razor scooter looks great (we have selected the blue color here). The kids Razor scooter is among the most popular kids push scooters. 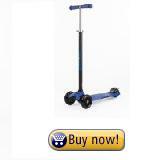 It is very well-made (made of very light weight aluminium alloy) and unlike other push scooters it is very sturdy. It is also very smooth and quiet. The other scooter that we recommend is the Maxi Kick Scooter by Micro designed for ages 6 and above. This kids push scooter is more sophisticated than the Razor scooter as children can also lean in order to steer it making it more fun. It is also very lightweight and very durable. The Micro scooter is kind of like the Rolls Royce of scooters. It has won many awards and has been selected many times as the best scooter for kids. By the way, if you are looking for an original birthday gift idea for a child, a kids push scooter can definitely be a great idea and a great gift that will get a child very excited.